Model B1 is the same as Model S1 with a bank added. When taxes are increased more money has to circulate. The money has to be issued by a bank or borrowed from a bank, which is the same thing. The bank can be the central bank or a private bank or even from abroad. When taxes are increased the tax revenue comes with a delay. The difference can be borrowed by the public sector or by the private sector (or by the households ?). No interest is payed in all examples. 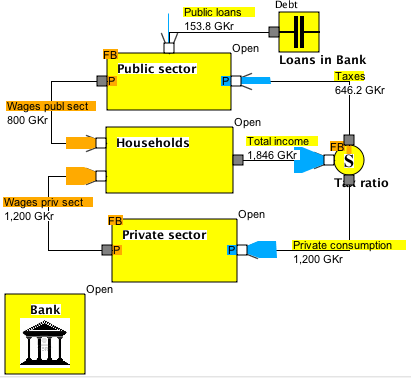 The figure below shows the case of public loans. Tax revenues from the previous period is 646.2 GKr and the public sector wants to spend 800 GKr by employing new personal. 153.8 GKr are missing and are borrowed from a bank. NOTE: I forgot to tell you how to open the dialogs for setting and viewing flow properties, Right click on the name label of the flow. 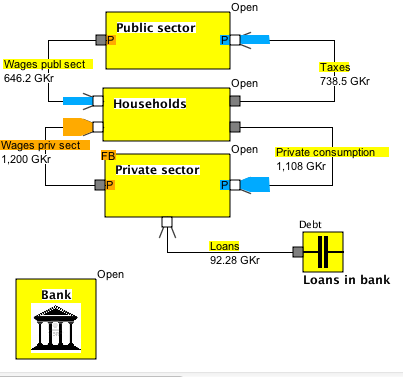 Part 1 with new sectors, two flows and naming the flows. Part 2 with setting units and adding taxes and consumption. Part 3 with adding the bank and the debt account. Part 4 with setting magnitude of flows. Part 5 with exploring the result. I explain some features of the model in this Video. The PowerPoint-presentation Economic Circular Flows short presentation discusses how the economy expands and contracts with loans and tax ratio. The other case is when the private sector takes loans. Total consumption goes down in the first step and so does the income of the firms. In order to keep the personal the firms have to borrow the missing income from a bank. After some time tax revenue goes up and the public sector can employ people. The new employers by consume more and the firms increase their income. The is still an income deficit and more money, but less money, has to be borrowed. The process goes on and finally the firms have borrowed a total sum of 153.8 Gkr. Note that this sum is the same as when the public sector borrowed the money. The big difference is that the timing is different. Model B1 Private sector borrows. other dynamic effects also. This remains to be investigated.